The Stylish Five: Cuddle Up With Cold Weather Accessories! The weather is about to shift dramatically this weekend here on Long Island, but that’s no reason for your style to suffer. Now is the time to invest in some fashionable & comfortable cold weather accessories, items that perfect for bundling up when out & about. This includes a hat or headband, scarf, cape, gloves, & earmuffs. These pieces present the perfect opportunity for adding pops of color to your outerwear look, or playing down a bolder coat with neutral accessories. 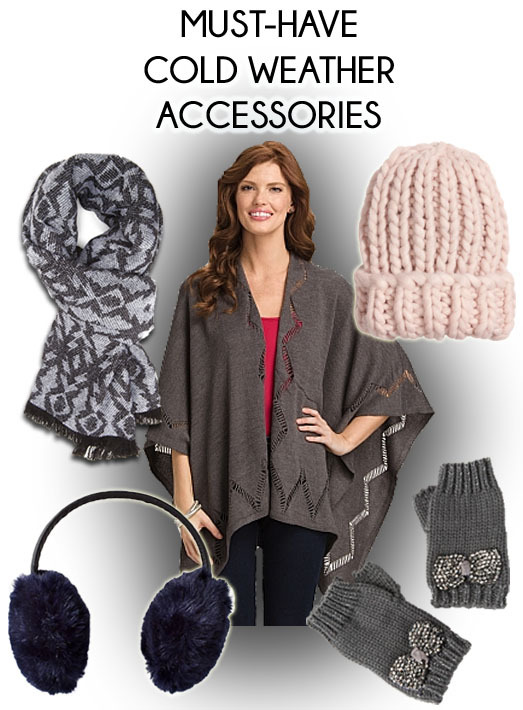 My picks include: scarf ($12.80) in tribal @Forever 21, hat ($12.95) in powder pink @H&M, cape ($39.50) in gray @Dress Barn, earmuffs ($39.90) in navy @Express, & gloves ($18.00) @Francesca’s. What’s your go-to cold weather accessory? Where do you like to shop for affordable accessories? For more stylish posts, check out Anna Kendrick for Marie Claire‘s December issue, bowed ballet flats from Kate Spade New York & ALDO, & Gwyneth Paltrow’s new beauty campaign for Max Factor! Happy Styling! This entry was posted in Accessories Access, Basics for a Bargain, Holiday Gift Styles, Quickie Darling Deal & Steal, Style Darling Daily, The Stylish Five and tagged accessories, Accessories Access, affordable fashion, Basics for a Bargain, cape, capelet, cold weather accessories, Dress Barn, Express, fashion, Forever 21, Francesca's, gloves, H&M, headwrap, Holiday Gift Styles, holiday style, knit hat, mittens, poncho, Quickie Darling Deal & Steal, style, Style Darling Daily, style for days, style tip, The Stylish Five, tribal scarf, winter fashion. Bookmark the permalink. ← Cover Craze: Anna Kendrick for Marie Claire’s December Issue!